Before cooking rhubarb there are a few steps you will need to take to clean and prepare it. This is a guide about cleaning rhubarb. We made a batch of strawberry rhubarb jam. I washed it and cut off the ends. When I cut it in small pieces to cook, the red outside pulled off into strings. I went ahead and pulled the rest of it off. Should I have left it on? I haven't been able to find the answer to this. 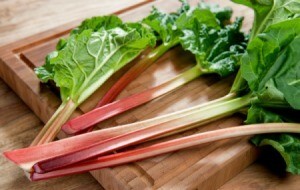 Nobody that I know has ever bothered pulling the strings off rhubarb. The rhubarb you had was probably field grown rather than greenhouse grown. The strings needed to be rmoved, as they are quite fibrous and tough and do not cook down well. Greenhouse grown rhubarb usually has more tender stalks. When I used to help my grandmother with rhubarb from her garden, we always had to string it. How did the jam turn out? Could you have put it through a blender to puree the strings before making the jam? I once made strawberry jam this way, and received so many compliments on it. It turned out to be a fruit spread that tasted wonderful.